During the summer, we try to make time to go out and have a picnic in the park or in some outdoor area to enjoy the weather. 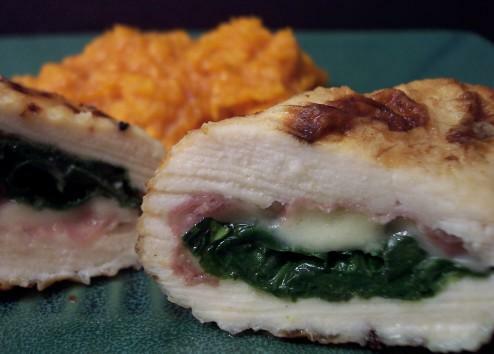 Now that it is cold, we don't get a chance to do that - so for dinner tonight, we tried out a couple recipes for the next warm season and had a little picnic inside! For the side tonight, I made a recipe for Bulldog Salad - basically a lighter version of a Waldorf Salad. There are a couple things in this recipe that make it more colorful and have a bit of a different taste to change up the flavors. 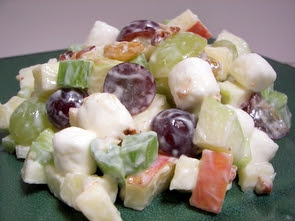 Sweet pieces of Fuji and tart chunks of Granny Smith apples are mixed with green and red grapes, celery, golden raisins and toasted pecans. For a fun and squishy addition, miniature marshmallows are tossed into the mixture. Coating the fruit and veggies is a tangy dressing made from yogurt, mayonnaise and sour cream. If you use a plain yogurt, you may want to add some lemon juice to brighten up the dish - although we used a vanilla yogurt to add a slight hint of sweet vanilla to the salad instead. So what did we make to go along side that would work for a picnic? 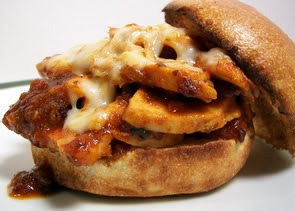 Honey-Chipotle Barbecue Chicken Sandwiches! While we would have to do a couple changes to cook these outside on a grill, it will be very doable. Since we are using boneless/skinless chicken breasts, we wanted to gently cook the chicken to keep it as moist as possible, but we still wanted give them a boost in flavor. We quickly poached the chicken in water (you could use chicken broth if you had some leftover) laced with cumin and thin slices of fresh garlic. While the chicken cooled, we made a thick homemade barbecue from garlic, cumin, tomato puree, chipotle chiles with adobo sauce, cider vinegar, honey and Worcestershire sauce. As this cooks, we thinly sliced the chicken breasts and added them into the sauce for a couple minutes to allow the chicken to warm back up and take on some of the flavor. We toasted up a couple of our favorite burger buns and topped the bottoms with the sliced chicken dripping in sauce. We opted to top them with smoked mozzarella that we needed to use up, but feel free to use what you like - Monterey Jack would be an excellent choice. The tangy barbecue sauce is quite hot from the chipotles - but a sweet and smoky background keeps your appetite wet and anxious to go for that next bite. However, you may want to seed the chiles if you don't do well with heat or would be serving these delicious filling sandwiches to young ones. 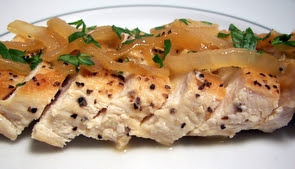 Jeff is not keen on raw onions, but a couple thin slices on top would be a pleasant accent to the chicken and sauce. We're back with another round of what we made for the weekly Wednesday Treat Day at Jeff's office. Today's recipe, Crispy Peanut Butterscotch Fudge Squares, brought several of our favorite flavors together in a sweet little package. The bottom layer is your basic Rice Krispie Bar with an addition of smooth peanut butter mixed in when you are melting the marshmallows. This is then pressed into the bottom of a baking dish to form the crisp crust. 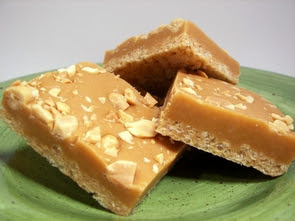 What is poured on top is a layer of butterscotch and peanut butter fudge. This is made from butter, sugar, evaporated milk, marshmallows, butterscotch chips and peanut butter. A sprinkling of chopped peanuts on top adds a final touch to bring the two layers together. When you take your first bite, you notice the ultra creamy fudge that has a complex duo of flavors and then you hit the contrasting crunch of the peanut buttery Rice Krispie layer. 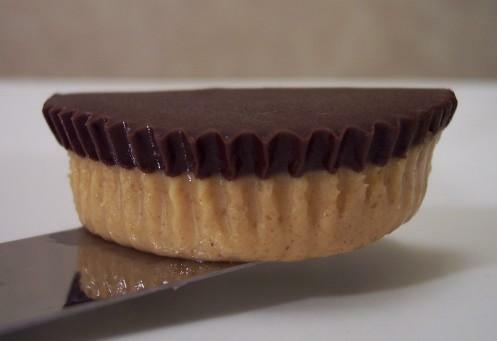 You could easily adapt this to a variety of flavors to match what you like... one example that quickly came to my mind - you use cocoa rice kripies in the bottom layer and bittersweet chips in the fudge to satisfy the chocolate/peanut butter lovers out there. Would you like to take a bite out of these sweet indulgent treats? Besides, it's just a Rice Krispie Bar with a fancy new hair-do... no? A long time ago (right about when we started getting into cooking), we attempted to make spaetzle even though we had no spaetzle maker or even a colander as suggested in several recipes. We ended up using a plastic zip-lock bag and cut the tip off to dribble the batter into the boiling water.... it worked, but what a mess! 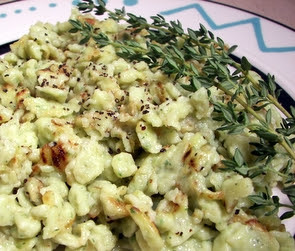 I got the urge to try this recipe for Herbed Spaetzle and even though I've been tempted to buy the tool used to drop the batter into the water, I didn't want to wait to get it. I ended up using a large spoon-like utensil we already owned that had the requested 1/4" round holes. 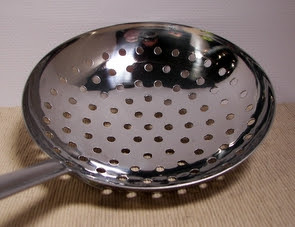 We do have a colander, but I thought this tool might work a little better. While it actually worked quite well, it was still messy - I'll think I will be cleaning up for awhile! To make these little nuggets bursting with fresh thyme flavor, milk is first steeped with a few springs of thyme. The sprigs are discarded and the milk is pureed with more fresh thyme leaves, parsley, salt and eggs. This is then whisked into all-purpose flour until the mixture is smooth. We pushed the mint colored batter through the utensil and into boiling salted water - when they floated up, we shocked them in ice water to stop the cooking. This took quite a few batches, which is something I didn't account for... so dinner was a little late tonight. My batter was a little on the thin side, so I think my pieces cooked up a bit on the smaller side - when I make this again, I might decrease the milk just a touch. Once the batter is used up, the spaetzle is then lightly browned in a hot skillet of melted butter. The spaeztle have a tender texture on the inside with a buttery shell that help to keep them separate. Jeff mentioned that he thought they were going to be mushy when he saw me pull them from the water, but after he ate his first fork-full, he muddled "this is so going to be my lunch tomorrow!" I see! Maybe it is time to invest in one of those fancy spaetzle makers after all? Jeff's first comment... Chocolate what? 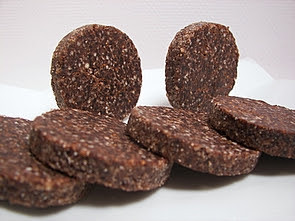 Always looking for different and fun treats to make, this recipe for Chocolate Salami really caught my eye - although I have to say I did change the name. It was originally called "Divinely Dairy-Free Chocolate Coins"... however, I like our less-wordy version better - call it whatever you like! 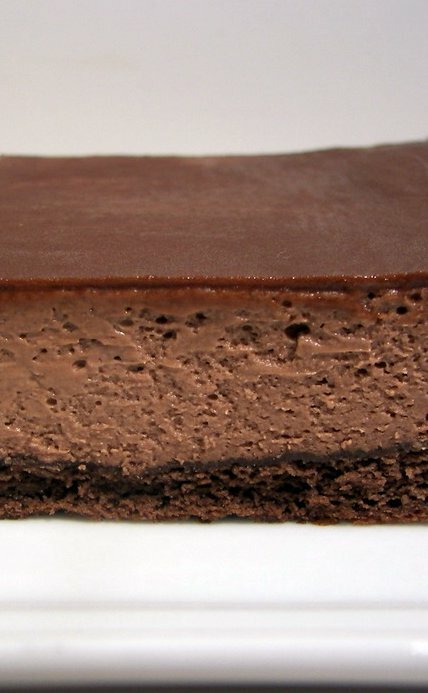 The only "cooking" at all that happens with this recipe is melting bittersweet chocolate - I did this over a double boiler, but feel free to nuke it on medium in the microwave. Whole raw almonds (skins on please!) 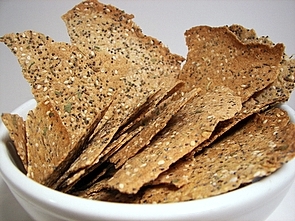 are coarsely chopped with a dash of cinnamon in a food processor. Dried black mission figs are added and the mixture is processed until finely chopped. Mixed into the melted chocolate, this is then formed into a long thick roll. As the roll is a little tacky to the touch (not sticky though), it is then coated all over with a very small amount of vanilla sugar. After chilled in the refrigerator, the roll can easily be cut into dense rounds. Nutty and rich, I was afraid you would only be able to taste figs - but each flavor held up on its own. While adding a bit of sweetness to off-set the chocolate, the figs also added a slight crunch. 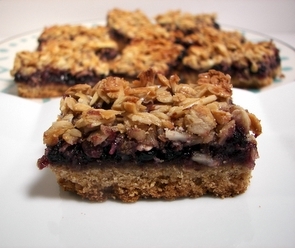 This was a surprisingly delicious, easy and healthy treat! 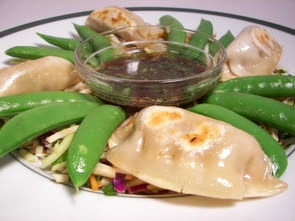 We doctored up a couple store bought items for tonight's dinner of Pot Stickers and Slaw with Asian Dressing. The original recipe called for a mix of shredded cabbage and carrots, but we prefer the broccoli slaw version that has broccoli, shredded red cabbage, carrots and cauliflower - it is crunchier and we like the variety of flavors. The other store-bought item we had to locate were some veggie pot stickers - I've never had a reason to buy them before, but after a strolling through a couple stores we finally found some at our local natural food co-op called The Common Market that we've mentioned before. To doctor up the slaw a little, we mixed in fresh cilantro and a green onion - then drizzled it with a sauce made from rice wine vinegar, soy sauce, cilantro, toasted sesame oil and fresh ginger. To tie in the flavor from the sauce, we also go on to crisp up the pot stickers in some more toasted sesame oil. Once browned, we added water and covered them to finish warming them through. For a snappy finish, we quickly cooked sugar snap peas in the same pan until they were crisp-tender. The salty sauce made for a good counterpoint dressing to the slightly bland slaw and a fantastic dipping pool for the vegetable pot stickers. With lots of satisfying crunchy textures all around, I have to say that we quite enjoyed having pot stickers for the first time - we just may have to make our own next time! 9 new recipes this week - our favorites this time were the Vermont Oatmeal Maple-Honey Bread, Smoked Cheese Pasta Bake, and the fun, but tedious, Key Lime Sugar Cookies. I am almost caught up with the recipe section to the left - I am about a week behind, but I added quite a few more today. Today's side dish and dinner were both of the quick and easy variety. After a long day today, I didn't feel like doing too much. 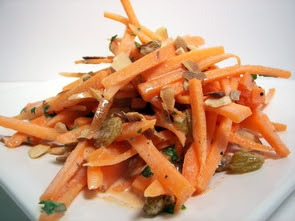 To go with dinner, we threw together a Quick Carrot and Raisin Salad. While cutting the carrots into sticks did take a little bit of time, you could always go ahead and buy the pre-cut bagged version to save even more time. The crunchy carrots are tossed with plump golden raisins, fresh parsley and just a couple tablespoons of red onion to give it slight bite. A creamy dressing made from mayonnaise, fresh lemon juice, sugar, cumin, paprika, salt, cinnamon and garlic add a slightly sweet and smoky coating. After a quick rest in the refrigerator so the flavors have a chance to take hold, a sprinkle of toasted almonds adorns the top for a nutty finish. I always have pieces of boneless/skinless chicken breasts in the freezer, wrapped individually, so they can thaw quickly and I am able to pull out as many as I need at the time. With this dish, Black Pepper Citrus Chicken, the chicken is seasoned simply with salt and pepper and seared in a touch of olive oil until each side gets a golden finish. Even though the chicken is still raw in the center, it is removed so you can cook some start cooking the sliced onions and garlic together. Once they are softened, a splash of white wine goes in to loosen any tasty bits left on the bottom and then the half-cooked chicken is placed back in. Fresh orange juice and lemon juice are added and the skillet is covered to allow the chicken to finish cooking without drying out. You could definitely taste the extra pepper here, but I could have probably added a touch more (or used a bit coarser textured peppercorn). With the wine and bright citrus juices, the sauce was a bit acidic, but it didn't seem to overpower at all and we found that the added onions helped to cut that taste down. 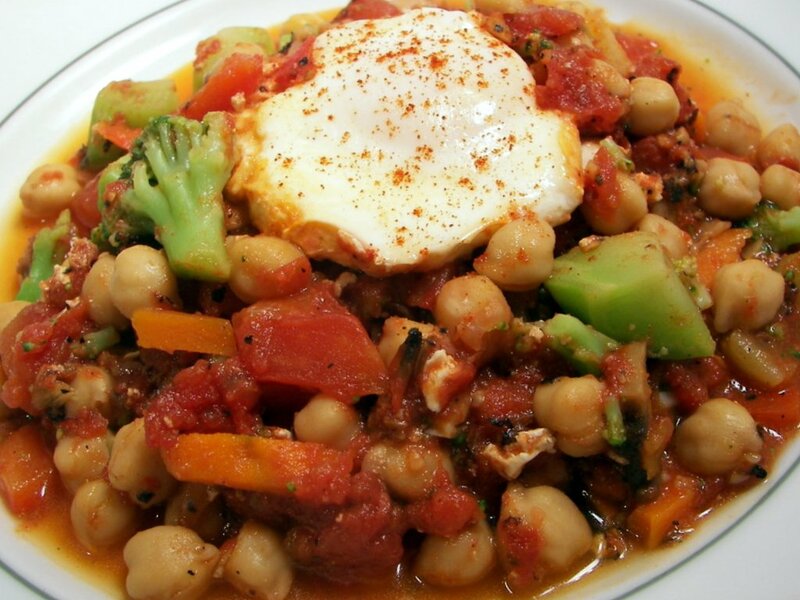 While this was not anything too exciting, it was a quick, basic and flavorful dish. Because there are endless ways to make one of our favorite cookies, we rarely make the same biscotti twice. We've even made them colorful with jelly beans! 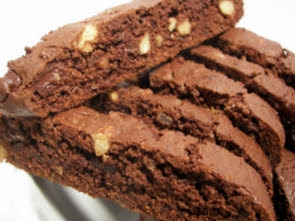 This time we turned to the dark side for these cookies with today's recipe of Double Dark-Chocolate and Ginger Biscotti. Dutch-process cocoa powder along with chunky pieces of dark chocolate are the two forms of chocolate here. Usually, but not always, some sort of nut is added to biscotti dough - I think hazelnuts would be a fantastic choice here, but we went a different route and chose a more rich walnut. To give the cookies a spicy edge, we added some finely chopped crystallized ginger with the nuts. We either make biscotti with softened butter (more tender) or using only eggs as the binder (more crunchy) - however, this time canola oil is used. The dough was about the same - maybe a little more sticky, but I thought the texture after baking was intriguing. It was a little more soft than using only eggs, yet more crumbly than when we use butter. Even though the texture in your mouth was more crumbly, we still got clean slices when we went to cut the baked biscotti loaves. Since the crystallized ginger has a sweetness to it, it pairs well with the chunky pieces of the slightly bitter dark chocolate - which surprisingly stay somewhat soft and a little gooey in spots. 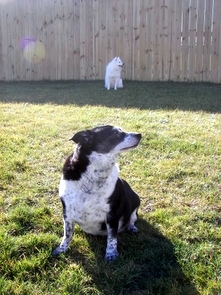 Uh oh... the dogs have been without treats for almost a week now! I couldn't stand the "look" they give in the mornings anymore, so I figured I better get going on making them more! 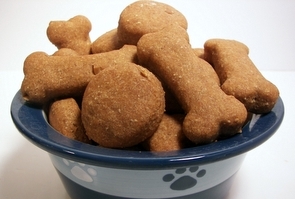 If you're looking to give your pups an extra special treat (or your feeling guilty! ), then these Peanut Butter Bones may be one to try. These bones have quite the ingredients in them - mashed potatoes, milk, molasses, chicken broth and chunky peanut butter... how could they resist? The dough looks a little ragged when you start, but after just a couple minutes of kneading it turned into this beautiful supple dough. Depending on the moisture in your potatoes and the weather, you may need to add more or less all-purpose flour as you go along - just gradually add what you need until it does not stick to your fingers. This was a dream to roll out and makes a large amount of biscuits, depending on the size cutter you use. I kept the dough fairly thick when I rolled it out - right around 1/2" thick, as I wanted to keep these more chewy than rock hard. You could roll them thinner if your pup likes those extra crisp treats. While this is a yeasted dough, you won't need to let it rise - it just gives them a little lift and helps with the texture. Tonight's dinner, Turkey-Potato Casserole, sure turned into an interesting meal tonight. 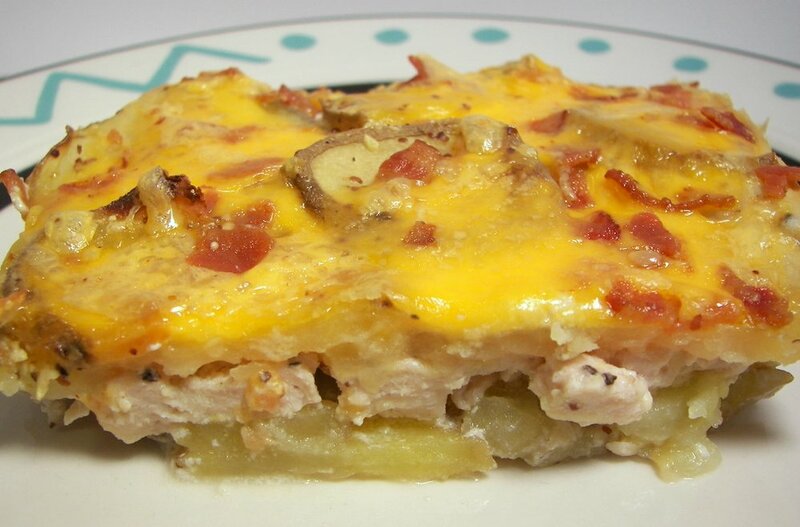 Basically this is a two layered sliced potato dish with ground turkey in between. When we have done something like this before, any type of meat has usually been cooked - however, this time it just called for ground turkey so we went with it. Once it was all layered and seasoned, it called for 3 cups of milk (full disclosure - it also said you could use cream) to be poured on top - which we did. This cooks for 1 1/2 hours to allow the potatoes to get very tender and to fully cook the hidden layer of turkey. Before serving, we scattered sharp cheddar and crumbled bacon on top and set it under the broiler until bubbly and melted. Now, I'm not sure if we did something wrong or there was too much liquid, but after it had finished cooking there was so much milk left that we could pour it out of the pan! We both looked at each other with that "huh!" look on our face as we were not sure what happened. Maybe if you use cream it would thicken up enough in 1 1/2 hours, but for us it did not. Besides that issue, it was actually quite good! The turkey was fully cooked and surprisingly still quite juicy as it basically poaches and slowly soaks in the seasonings. The potatoes, while still being very tender, we not overly mushy and had a good texture to them with a slight tang from the Dijon. The gooey and salty mixture on top added just the right finishing touch. By the way, if you happen to use a food processor to thinly slice the potatoes as I did, please do your self a favor and remember that when you go to wash the dishes that the slicing blade is lurking near the bottom. One deeply sliced finger (which makes it hard to type) will be all that I need to remember next time. Ouch! PS - We will be switching the blog over to the new version tonight. If you happen to spot any issues, please don't hesitate to send us a note with any problems! I noticed that our bread supply was getting low in the freezer and I had some extra time today so I went ahead and baked a couple loaves of this Vermont Oatmeal Maple-Honey Bread. 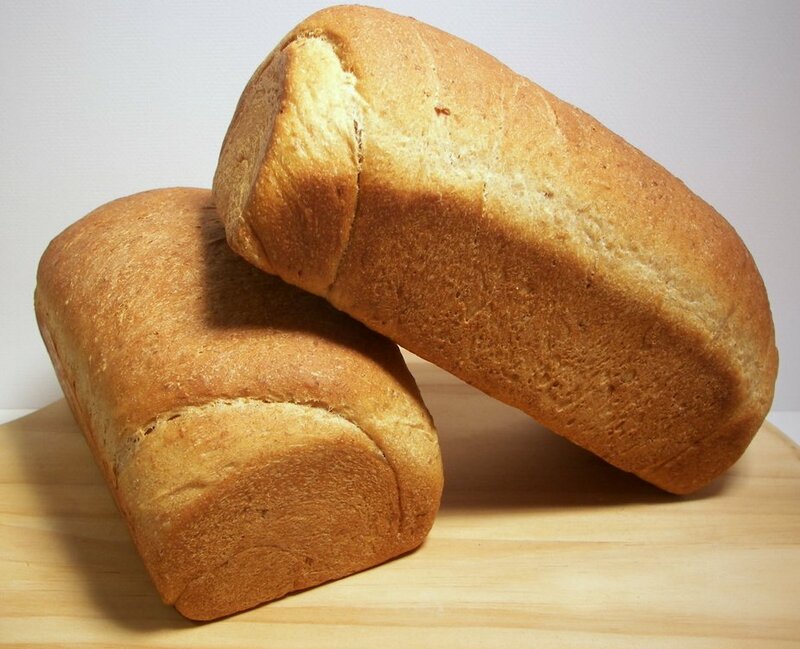 This is a tender and slightly sweet bread that would make for a great sandwich or a killer piece of toast slathered with peanut butter. It has an interesting start by mixing rolled oats, maple sugar, maple flavoring, honey, butter and a dash of cinnamon with boiling water. This will soften the oats and allow them to melt into the bread and add a hearty chew to the loaf. The dough was very easy to work with and I had no problem incorporating some white whole wheat flour along with the all-purpose. I already had maple sugar on hand, but I know it is not easy to find and can be fairly expensive. So if you want to make this, don't run out and try to find it - just use brown sugar. It won't have that deep accent of maple to it, but I think it would work out just as well. Fresh homemade bread always smells wonderful, but the addition of cinnamon and maple made these very intoxicating. The aroma coming from these loaves as they cooled made it very difficult to wait and slice them. If we ever sell this house, I'll have to remember to bake these before a showing! We had a fairly light dinner tonight... this Wheat Berry-Cranberry Salad was probably meant to be a side dish, but instead we just increased the portion size a bit and had a couple toasted slices of the bread we made earlier. 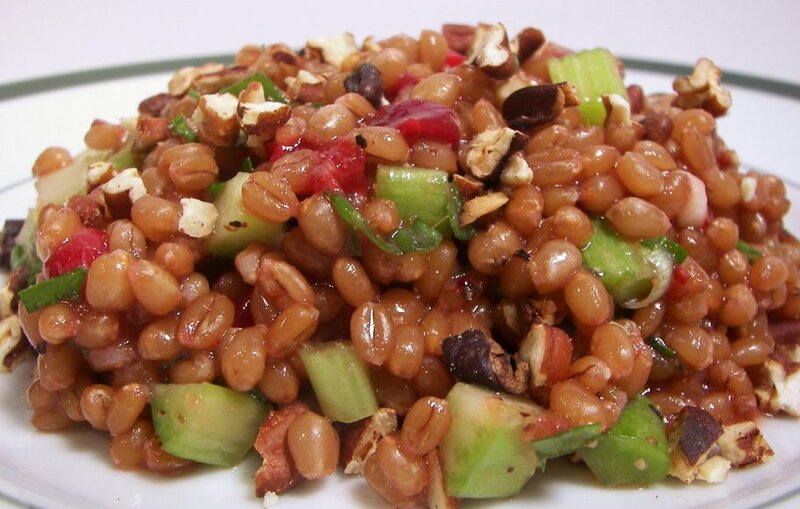 While this is really a no-fuss recipe, there is a step or two that needs to be done hours before you want to eat from the use of wheat berries. This grain, also called hard winter wheat berries, is whole kernels of wheat that have only had their outer (inedible) hulls removed. Because of this, they need to soak for about 8 hours and then require another hour or so of cooking until they become tender. To dress this salad, we first boiled cranberries in pure maple syrup until they began to pop. This is then combined with cranberry juice, olive oil, vinegar and Dijon mustard. Crisp diced celery, sliced green onions, fresh parsley and chopped toasted pecans are then added to round out the salad. The dressing has a pleasant balance between the tangy and sweet flavors that coat the lightly nutty and chewy wheat berries. Besides adding flavor, the toasted pecans and celery add a welcome crunchy texture against the softer berries. When Jeff came home this afternoon, he brought me down to the computer and brought up the blog... he said "Can you believe it?" I had no idea what he was talking about and he finally pointed it out that the counter on the right side said we crossed over the 1,000,000 visitor mark! I'm not sure when it happened, but that's pretty cool! I had no idea when we started this blog that people would ever really come check out what we were bakin' for treats or what we had for dinner that night. We've been turning to a lot of comfort-style meals with the chilly weather finally coming upon us - pasta dishes are a notable one for us (and can you believe I wouldn't touch the stuff growing up? Man I totally missed out!) so tonight's dinner of this Smoked Cheese Pasta Bake fit the bill. While we cooked a pound of whole wheat penne, we warmed up some leftover chunky marinara sauce from the freezer. I seasoned the sauce with a bit more salt, pepper and crushed red pepper - then tossed in some chopped frozen (but thawed!) spinach. Once this has a chance to warm up and the flavors begin to meld, the penne is mixed in and we started making a tangy cheese mixture. Sour cream, shredded smoked mozzarella and fresh basil are combined to form a creamy sauce that we layer in between the pasta when we assembled the dish. Fresh grated Parmigiano-Reggiano (which I didn't find too sharp this time... hmm!) is finally scattered on top and then this bakes until bubbly. 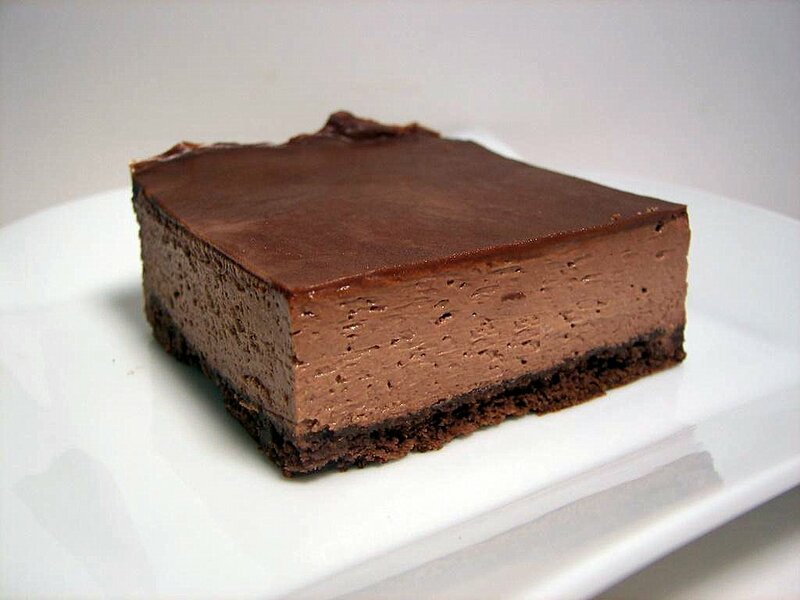 I love how the top layer gets a little crispy, but the underneath layers still remain moist. The middle cheese layer has a mild, but detectable, smoky hint to it - I thought it could have used a bit more of the smoked mozzarella though. 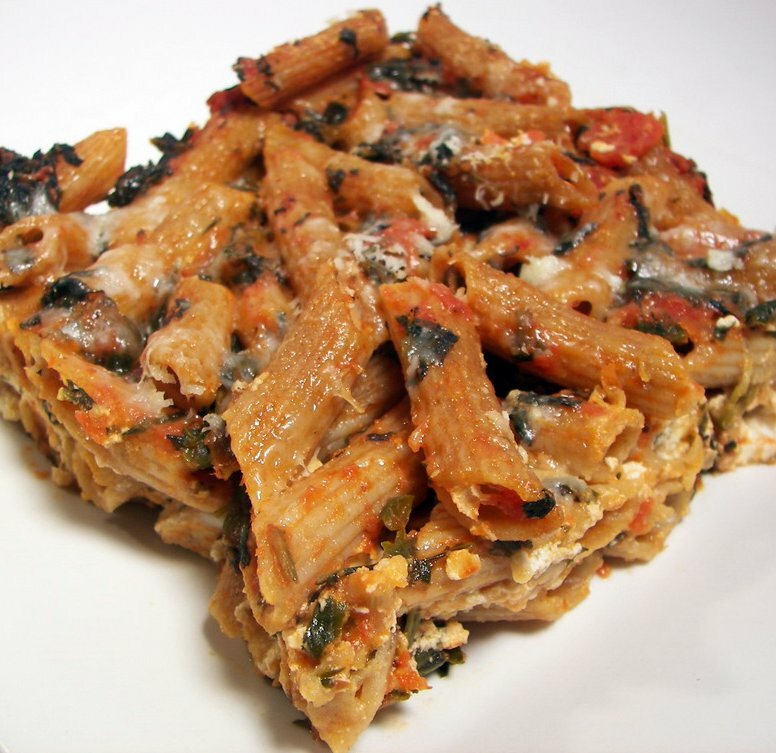 Filling and hearty, this is also a great way to sneak in some spinach to those spinach-haters out there - while the spinach does not totally melt away, it does not have a strong taste at all here. The smoked mozzarella can be a little tough and messy to shred - if you have issues, you can freeze the cheese for about 15 minutes and it firms up just enough to be a lot easier to shred. I've grown tired of squeezing the thawed spinach in a towel to remove the excess water - I've started using our potato ricer instead awhile ago and have not messed up another towel since! We are back again with what we made for the weekly Wednesday Treat Day for Jeff's co-workers at his office. 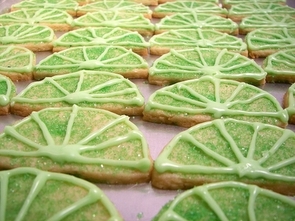 There are quite a few steps to this treat, so I started early by making the dough for these Key Lime Sugar Cookies yesterday. The dough needs time to firm up, so I figured I would break up the steps a bit and get a head start. We had do a couple unique steps before we began to make the dough so you will have to do a bit of pre-planning if you want to make these. The first step is mixing fresh Key lime zest with mild canola oil and allowing them to sit and let the intense flavor from the zest infuse into the oil. The next step is reducing down 6 tablespoons of fresh Key lime juice to just 2 1/2 tablespoons to condense the tart flavor without adding too much liquid to the dough. Once the soft dough has been made and divided, it is rolled out between pieces of parchment paper so you don't need to add additional flour that will toughen the dough. Before cutting out the circles, the dough needs a chance to firm up - it goes into the refrigerator for at least 30 minutes at this point. The well-chilled dough is then cut into circles and each round is cut in half. If the dough has warmed up too much to easily move them to the baking sheets, you can stick them in the freezer for a couple minutes. 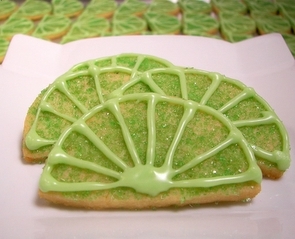 After being transfered, each half is scattered with a generous amount of coarse lime-tinted sugar. 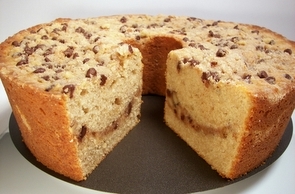 The cookies bake just until golden around the edges and then they need to fully cool before you begin to decorate them. To suggest that they are slices of limes, a quick icing of confectioners' sugar, Key lime juice and a few drops of coloring are combined. This mixture is then piped in lines around the cooled cookies. I would suggest using a fine #2 tip to do this or a pastry cone made from parchment paper - I had issues getting nice clean lines with mine as my smallest pastry tip is a #4. I would have liked them to be a little nicer looking, but I guess we can just call them "rustic" right? 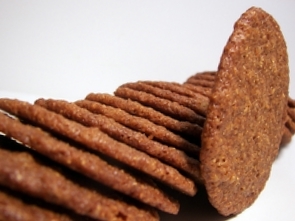 The cookies themselves are very crisp and pack a wallop of a sweet, yet still tart flavor. As you start to nibble your first bite, you immediately notice how the strong citrus scent commands your attention. 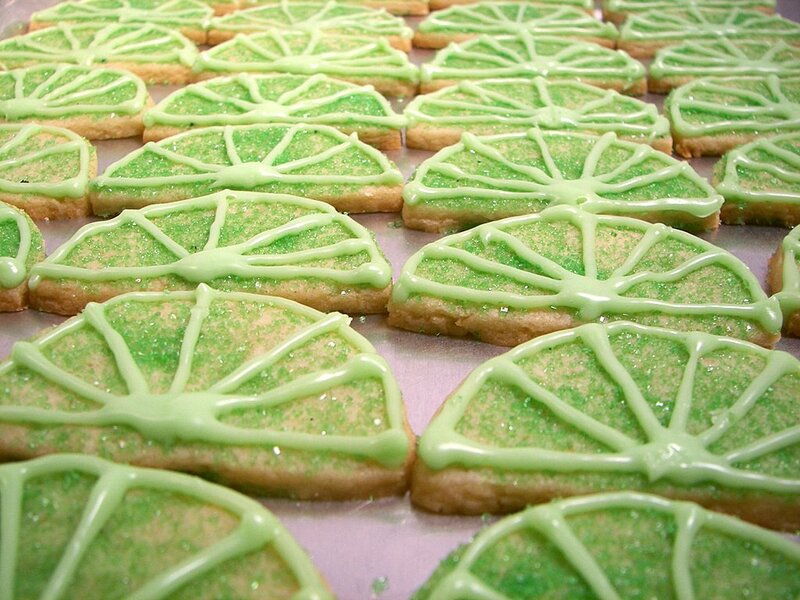 The coarse sugar brings a sandy crunch on top with the firm icing adding a sweet lime accent. Be sure to try these with the little fresh Key limes - I know they are no fun to juice, but it is worth it! Is it still risotto if you don't use rice? Well we hoped for a bit more snow, but we ended up with about an inch - Jeff even called his work's "hotline" to see if, for some reason they decided to tell people to stay home... he was a little disappointed when that was not the case! I felt tonight's dinner, Barley Risotto with Roasted Winter Vegetables, was fitting given the weather we've had over the past couple of days. While there are a few steps to this dish, it ends up coming together pretty fast as you are working on separate parts at the same time. Parsnips, cauliflower and red bell peppers are first roasted until tender and they turn a light golden color. While these roast, onions are lightly browned in olive oil, followed by the additions of pearl barley and chicken stock. 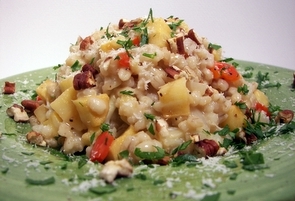 At this point, unlike traditional risotto, you do not need to constantly stir while it goes through the initial cooking - it is left alone to simmer until the barley absorbs the broth. The last cup or so of chicken broth is constantly stirred in once the barley is al dente to give it that creamy edge - however, it just won't be like a rice risotto as far as texture goes. Parmigiano-Reggiano and the roasted veggies are then mixed in and once plated, each serving gets a few toasted chopped pecans, a scattering of more fresh grated cheese and a sprinkle of parsley. I loved the crunch that the toasted pecans added to the tender and somewhat creamy barley along with the chunky golden roasted vegetables which brought a natural depth to the dish. I was not sure if I would like the sweeter parsnips here, but Jeff and I both enjoyed them. My only issue was with the cheese - I'm definitely in the "more cheese please" crowd, but our Parmigiano-Reggiano was almost a tad too sharp for us. It was a fairly higher-priced cheese than we would normally get, so it may be that we just are not used to its strength - I would reduce it a tad if we used it again. Here we are on January 21st and it is finally snowing more than one or two flurries! I think Spike might pass out from excitement! Now, we can't get too excited as they are only calling for maybe an inch, but at least it is something! 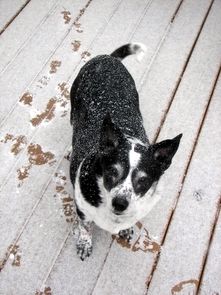 If it is going to be this chilly, I would rather see some white outside, rather than the dingy brown grass! Before we went out grocery shopping this morning, I wanted to make a warm and hearty breakfast that didn't take a lot of time to throw together. 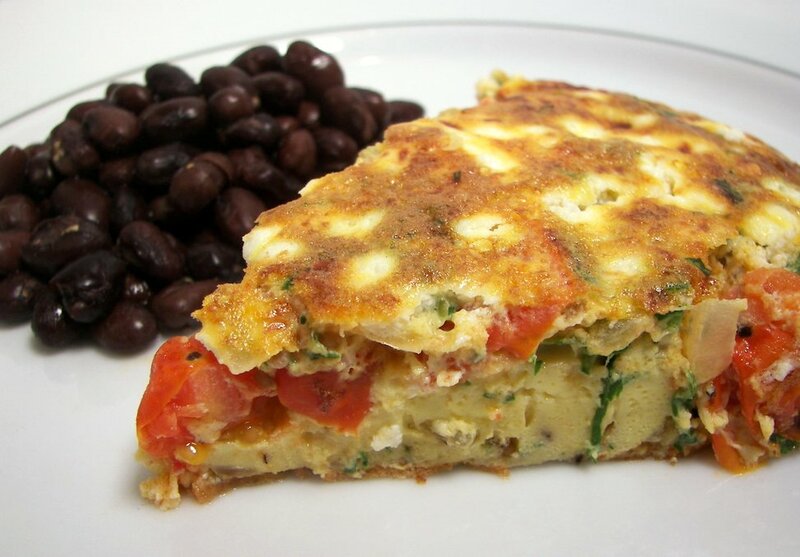 While we do quite like waffles or pancakes, I went for something that would be a little different and made a Ranchero Frittata. Frittata's are fantastic vehicles for those bits and pieces of ingredients laying around waiting to be used up or tossed. In this recipe, chopped onions and juicy halved cherry tomatoes are cooked in olive oil until the onions soften. Eggs and egg whites are whisked together with parsley - this is then stirred into the tomato and onion mixture with a couple chopped jalapeño peppers for a southwestern flare. Crumbled soft goat cheese is then scattered over the top and the mixture cooks, covered, until the eggs are just beginning to set. A quick trip under the broiler will finish the eggs off and give the top a gorgeous brown color. We loved the tang the goat cheese with the mild heat from the jalapeños added to the creamy eggs - Jeff said the only downside was that it had a slightly too onion-y flavor for him. We choose to serve some quickly warmed black beans seasoned simply with salt and pepper on the side. It is a very blustery and chilly day today - I took heed and baked another batch of our favorite new hamburger buns. We've really succumbed to these and they keep turning out consistently well! 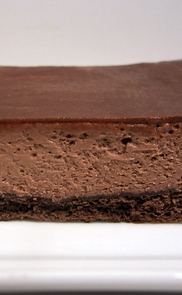 Yesterday I made some Double Chocolate-Mint Cheesecake Bars, but wanted to wait until today to talk about them. I decided to let them chill overnight before cutting and trying them out - however I did catch Jeff with a fork in his hand trying to sneak a taste last night... busted! I tried to tell him he couldn't have any now, but I think he knew that was an empty threat! When I thought about how I wanted to make these, a proper graham cracker crust came to mind... but I was feeling a little lazy and instead just layered the bottom of the pan with chocolate graham crackers. If you choose this simple and quick option, just try to cover the bottom as best as you can without layering them. The batter for this three-layered dessert is a sumptuous combination of soften cream cheese, Dutch-process cocoa powder and rich sour cream. Granulated sugar is added to sweeten along with cornstarch to help thicken and set the cheesecake. Once it was baked until just set in the center, I immediately scattered a handful of Andes Crème de Menthe baking chips on top. After sitting for just a couple minutes, the minty chips had softened enough to a spreadable consistency that smooths out to form the third layer once chilled. To let the flavors develop and allow the mixture to completely set, it is best to give this at least a 4 hour rest in the refrigerator at this point. Once well chilled, we were able to cut through the thin chocolate-mint crust to reveal a soft, luscious and creamy deep chocolate filling. I do have to give these bonus points as we were able to cut them into exceptionally clean bars. In the interest of trying to expand what foods we have, I'm always looking for recipes that will use an ingredient that we've never had, but still looks like something we should end up enjoying. 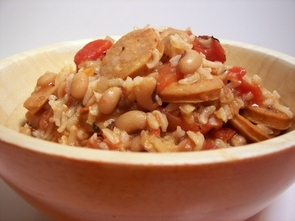 For example, in tonight's dinner - Black-Eyed Peas and Rice with Buffalo Chicken Sausage, it had plenty of things going for it that we already like, however we just have never had black-eyed peas before! The original recipe called for boil-in-bag rice, but I went ahead and prepared some fragrant brown basmati rice instead - just take it off the stove about 4 or 5 minutes before it is done. This way it can finish cooking and soak in a bit of the flavorful liquid you add later on. Besides the longer cook time for making the brown rice, this one-pot dish really comes together in a flash. Once some chopped onions have softened with garlic and Cajun seasoning, coin-sliced pieces of spicy Buffalo chicken sausage are added and cook for just a couple of minutes to warm up. Chicken broth, black-eyed peas, fire-roasted diced tomatoes and the almost-cooked rice go in and simmer until the rice is tender and the dish has thoroughly heated through. Right at the end, a couple shots of cayenne pepper sauce (I always use Frank's Red Hot) go in for a spicy kick. While it was somewhat hot, I did think it could use a bit more heat for us - but we like things spicy! We did like the body and texture the dish ended up having - it was just saucy enough to swirl around the bowl, but not so loose that is was soupy. My frozen ripe banana stash in the freezer was getting a little out of hand, so I wanted to bake something today to use at least a couple of them up. While most of the ingredients in this Banana Blueberry Bread are commonly found in quick breads, it does have a unique component that one might not typically use in baking - dry quick-cooking grits! 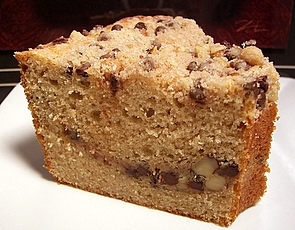 The addition of dry grits gave the baked loaf a textural crunch that mingled well in the moist soft bread. 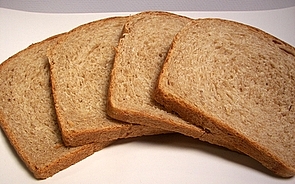 Along with vanilla extract, I used vanilla sugar to give the bread a sweet dimension of flavor - however, you can use regular granulated sugar just as well. Try not to over-mash the bananas, I find that it best when you can still see small bits and chunks rather than going for a smooth consistency. 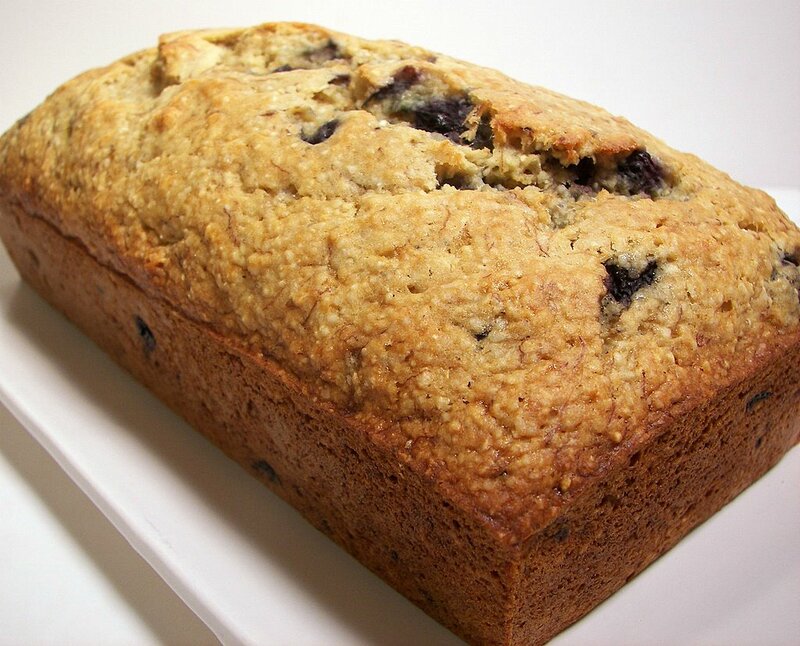 Besides helping to keep the bread extremely moist, the bananas do lend a nice, but subtle, banana flavor that matched well with the blueberries. 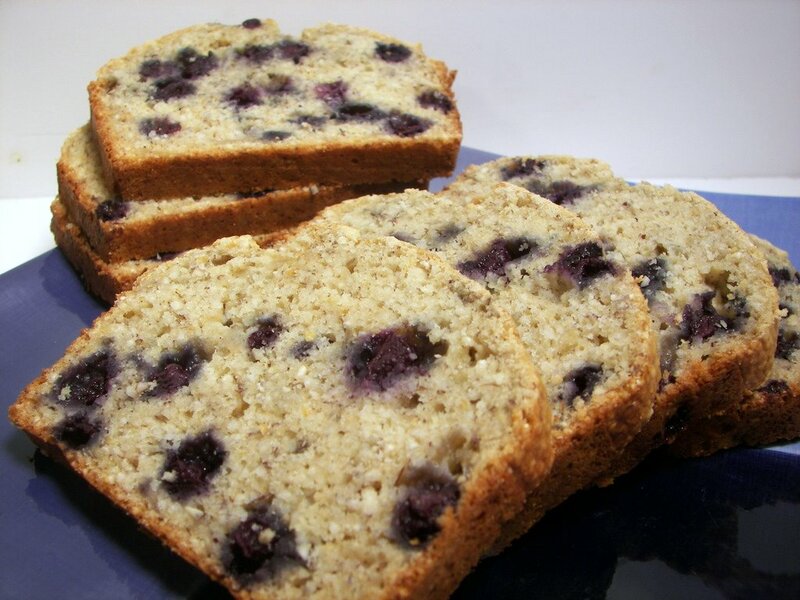 Since we are out of season, I used frozen wild blueberries as I have a lot on hand in the freezer - but I will have to remember to make this bread again when I can get a hold of some fresh blueberries. It gave off a wonderful sweet aroma while it was baking - as soon as Jeff walked in the door, I heard "I smell banana bread... where is it? I need to have a slice!" I loved how the vibrant blue dots are peppered throughout the golden slices without giving the loaf a purplish hue. 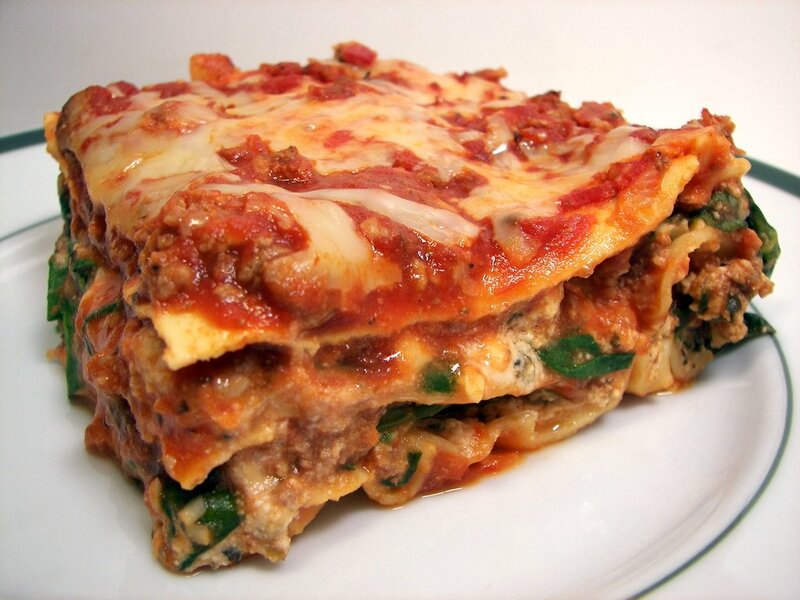 For dinner this evening, I made a recipe that could easily be considered a basic go-to recipe for lasagna. To start us off, we began by making a quick meat sauce for this Beef, Arugula and Spinach Lasagna. Ground sirloin and garlic are browned, then lightly seasoned with marinara sauce stirred in. I used some homemade sauce that I had in the freezer, but if you prefer ready made, feel free to use it. Before we begin to layer, we need to make the ricotta filling which consists of ricotta cheese, an egg, fresh basil, fresh oregano and a dash of red pepper flakes. While I always boil up lasagna noodles, this recipe called for the oven ready no-boil style (I used Barilla - the ones without any ridges) and I figured we would give them a go since we've never used them. Now that we had everything together, the messy, but fun layering can commence! Meat sauce first, then noodles, the creamy ricotta, some fresh baby spinach, peppery arugula, mozzarella cheese and then process repeats until you finish with the rest of the meat sauce. Now, the original recipe called for a 11 1/2 by 8" dish - I had one and used it... but it was obscenely full! It needed to be covered, so to be safe I first covered it with a piece of parchment and then put on the foil. Even though it was full to the brim, we did not have any boil-over issues... whew! I might suggest a bigger pan next time to be on the safe side. After sitting for about 15 minutes, we were able to pull out nice, clean and fully assembled pieces that held their shape well. This was a such a stomach warming comfort dish - with the hearty meat sauce, creamy ricotta layers and it has the big plus of using a bunch of pantry staples - it could easily be thrown together without much thought. We did quite fancy the texture of the no boil noodles - I can see how could be much more handy rather than trying to deal with pasta you pre-cook. 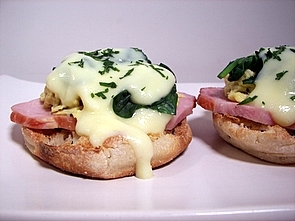 The dinner I made for tonight takes a leaner approach to the heavier classic Eggs Benedict. In this version, Eggs Benedict Florentine with Creamy Butter Sauce, we will begin by talking about the dish from top to bottom. 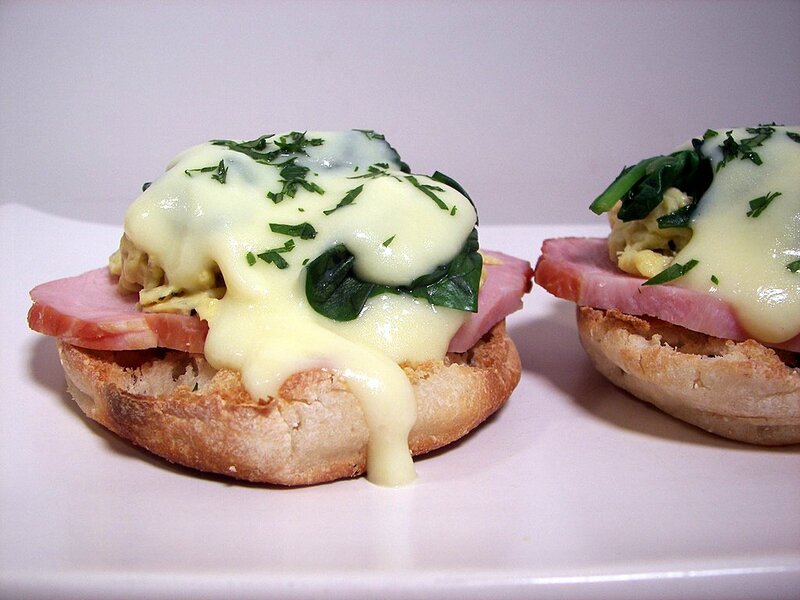 Reminiscent of a rich hollandaise sauce, this version is made by gently heating a mixture of buttermilk, water, cornstarch and eggs in a double boiler. You will see the mixture go from being very liquid to a luscious smooth and thick sauce - at this point, we stirred in a couple tablespoons of the clarified butter we made the other day to add the buttery depth needed for this sauce. If you wanted an even more traditional hint of flavor in the sauce, a bit of lemon juice might be a nice addition. Underneath the sauce is a layer of slightly wilted spinach. Instead of a poached egg as a traditional Benedict would have, eggs and egg whites are whipped together and cooked in a bit of garlic laced butter until just set and scrambled. This is the mixture that is found under the spinach. 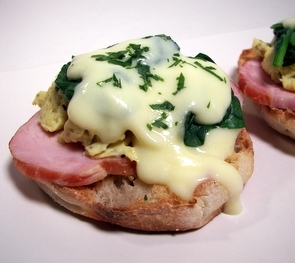 A slice of salty Canadian bacon is next to last with a toasted half of an English muffin forming the crisp base. Jeff and I both thought this was an absolutely fantastic lighter alternative - the sauce with the condensed clarified butter had so much more flavor that we expected and very much made this dish. Just enough of a buttery flavor to spike the richness, but still letting the soft set eggs shine through. 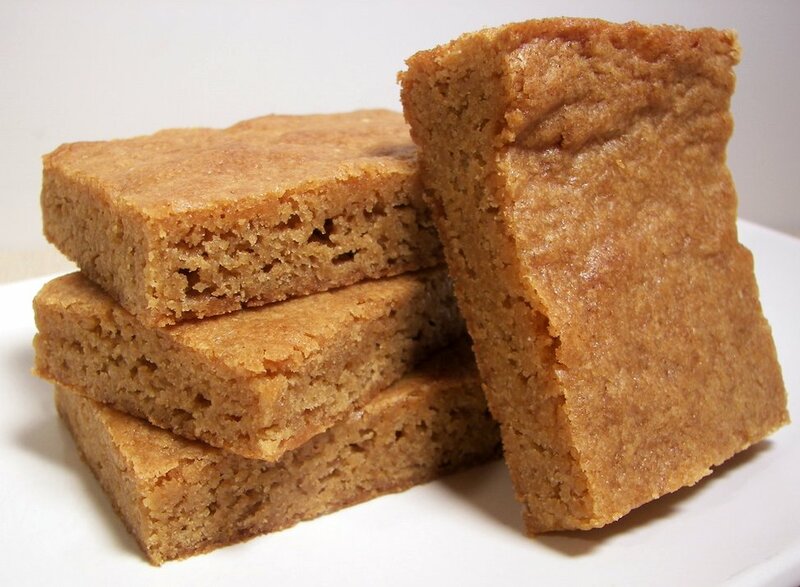 I asked Jeff what he thought would be nice for him to bring in for the Weekly Wednesday Treat Day this week at his office - he thought about it for awhile and decided some sort of snack or coffee cake would be a nice change of pace. I went through a couple of cookbooks and found a recipe that I've had marked to try for at least a year and a half! Since the past few cake recipes we've made for Treat Day have been in a bundt pan, I choose to assemble this Cinnamon-Nut Coffee Ring in a classic tube-style pan. Layered in between and on top of this cake is a sweet crunchy streusel made from toasted walnuts, mini chocolate chips, sugar, flour, cinnamon and melted butter. Once you cut through the butterscotch tinted crust, you reveal a bright golden yellow interior to see the hidden streusel layer waiting inside to be devoured. 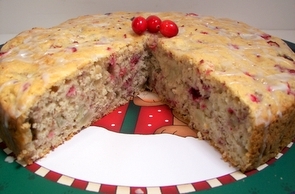 Tender from sour cream, this moist cake is buttery and dense, but not in a heavy way. There is a light cinnamon scent inside the cake that strolls through each piece as you bite into it - this helped to marry the flavor of the cake and streusel together. The mini chocolate chips added a fun twist - feel free to switch them out with dried cherries or cranberries for a different variation. When serving, I would opt to go for smaller slices - packed with flavor, a little goes a long way here. Don't be daunted by the amount of ingredients that are needed for the recipe, Beef with Spicy Cocoa Gravy, that we made for dinner tonight. 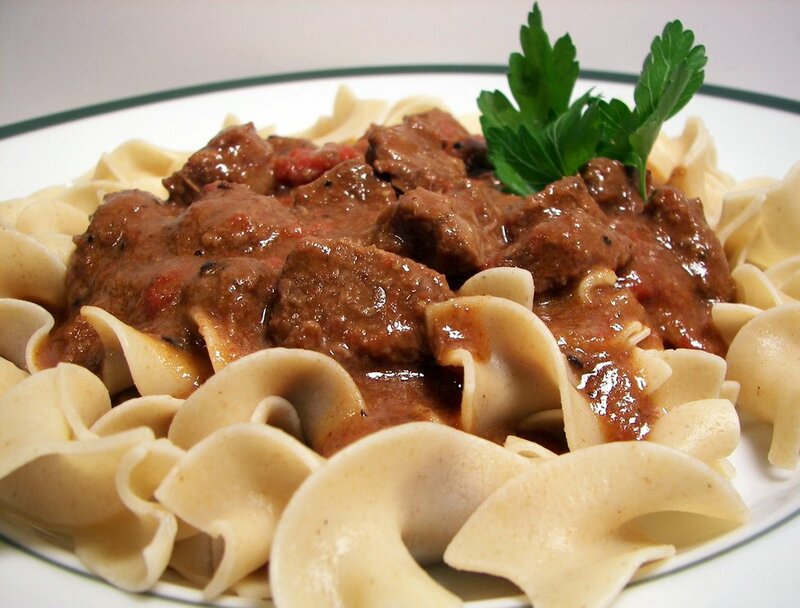 To flavor the meat, chunky pieces of top round steak are mixed with a variety of smoky and pungent spices - when thoroughly coated, they are then tossed with flour to help create a crust and to thicken the gravy later on. The original recipe has you toss all of the beef cubes in a Dutch oven to brown them - now maybe mine is small, but there was no way all of that meat was going to be able to fit in there and still have enough room to brown without them starting to stew. I choose to do this part in two batches - while it does add some additional time to an already lengthy recipe, it is very much worth it. When the meat is done, chopped onions and bell peppers go in to soften - they are followed by the addition of dry red wine for flavor and fire-roasted diced tomatoes. Beef broth, along with the browned meat, go back into the thin gravy and are allowed to gently simmer until the beef is fork tender and the gravy thickens into a beautiful hearty sauce. While the recipe name has "spicy" in it, don't take that to mean heat, there is little to no heat involved as the ancho powder is very mild - it just describes how flavorful this really is. While you won't detect a chocolate flavor from the cocoa powder, it wraps the flavors together and enforces a cohesive rich flavor. 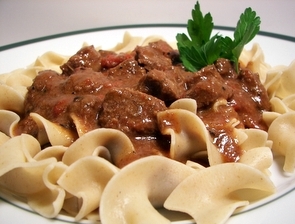 Since it has a good amount of extra gravy, I served this over whole wheat egg noodles and it was quite a filling dish. I did have plenty of time tonight to make this, but since it is fairly involved, this might be a meal better done on a lazy weekend. For the side dish to tonight's dinner, we needed to start by making Clarified Butter. I've never made it before, but it was actually quite easy. Basically all you are doing is removing the water and milk solids from unsalted butter - some solids float up to the surface, which are skimmed off with a spoon, while the rest sink to the bottom. What remains is liquid gold in the form of pure rich butterfat that is carefully poured out, leaving any remaining solids on the bottom of the pan. While it does loose some flavor, you are now able to sauté and fry without burning the butter as the smoke point is much higher. This also will allow the butter to be kept for a long time in the refrigerator. The process is the same for making Ghee - except you let the butter brown before pouring it out. We used a good portion of this in the side dish for Yukon Gold Potatoes Sautéed in Clarified Butter. Large chunky pieces of buttery Yukon golds are given a quick pre-cook by bringing them up to a boil and simmering for just two minutes. Once drained, they are added into a large skillet that has been heating the clarified butter. The heat is reduced and the potatoes gently cook in the hot molten liquid until they are tender and form a delicious crisp browned crust. Fresh parsley, salt, pepper and a minced garlic clove are tossed in right before serving for a quick burst of flavor. There is not much babying to do with this dish, so it can easily be done on the background while you work on other things - Jeff proclaimed this his new favorite way to enjoy potatoes! Tonight's dinner, Spicy Tomato Soup, is a great way to enjoy tomato soup off-season when fresh tomatoes are not quite up to par. Diced tomatoes get perked up by coating them in a generous amount of olive oil and broiling them until they begin to brown. This method worked well, except for the fact it made a mess in the oven. While you do drain most of the liquid away first, the juicy tomatoes were not so happy and decided to spatter a bit. Once colored, they are pureed in a food processor with a few cloves of garlic, a fresh red chili pepper (remove the seeds if you don't want it too spicy! ), a thinly sliced carrot and plain soy milk. Once fairly smooth, the mixture is brought to a boil and simmered until thoroughly heated. 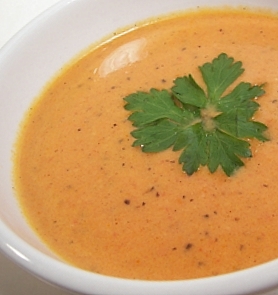 Finished with a splash of lemon juice to add a zesty freshness, the soup has a pleasant full-bodied texture being thickened by the carrot with the soy milk adding a creamy background. In anticipation of making this deliciously simple soup again, I made a note to only add a drizzle of olive oil to the pre-broiled tomatoes next time and adding the remaining oil later on in the recipe to try and prevent the spattering. One thing we don't do often enough is breakfast for dinner... it is a fun way to change things up and have something a bit different. Instead of a plain buttermilk pancake (which certainly has its place), we choose to liven things up with coconut in this recipe for Double Coconut Pancakes. Two shots of coconut flavor come in the form of using coconut milk for the liquid and adding sweetened flaked coconut to the batter. The original recipe didn't call for it, but I toasted the coconut flakes for texture and to add a different depth of flavor. 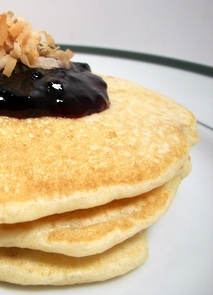 Since we used light coconut milk, the coconut flavor is mild and does not overwhelm the light golden pancake - however, it did seem to weigh them down a bit. I don't think I would describe them as dense, but they are not quite light and fluffy either. They are somewhat sweet on their own, so instead of dousing them in warm thick maple syrup, we heated up some leftover wild blueberry preserves for a gentle glaze. Jeff and I loved the mellow coconut paired with the fruity blueberries - a delicate treat for dinner. While I was making the crackerbread from the King Arthur Flour Whole Grain Baking book yesterday, a cookie recipe caught my eye and I happened to already have everything on hand. The dough needed to chill overnight, so I went ahead and made it last night so we could have some fresh cookies to snack on today. I've mentioned before that Jeff likes rye bread, so I knew I had to make these Molasses-Rye Snaps and see what he thought. 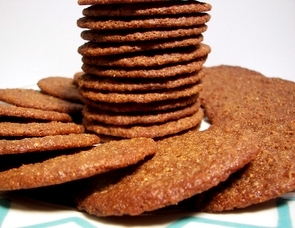 What also piqued my interest about these cookies was the use of only spelt and rye flour - no all-purpose or whole wheat. These cookies may not be for everyone as they are quite spicy - I don't mean "hot" when I say that though. Besides cinnamon and allspice, there is a double shot of ginger in the recipe. Along with ground ginger, sweet crystallized ginger brings an addicting bite. You don't want big chunky pieces though, so instead of dealing with the sticky factor of trying to mince it, a food processor easily took care of the job. Now, if you tried to process the crystallized ginger alone, it would probably get quite gummy - to prevent that, we added half of the spelt flour to it before processing. It kept everything separate and the processor had no problem getting the ginger very fine. In these dark cookies, just two tablespoons of molasses really brought out the hearty rye flavor with out any bitterness. I enjoyed the flavor, but the texture is what sold me - the outer ring of the cookie is crisp, but if you tried to bend them, they wouldn't break. They have just enough give to them which adds a wicked, almost on the verge of sticky, chew to them. These are not puny either - with only about 50 calories per cookie, I can't wait to pair them with a scoop of plain vanilla bean ice cream to make a more adult ice cream sandwich. Jeff requested to have something crunchy with dinner tonight and instead of having some chips that we like, I threw together a whole-grain crackerbread from one of our new favorite books - King Arthur Flour Whole Grain Baking. Because this is not a leavened bread, it takes a short amount of time to prepare - the longest part of the recipe was rolling it out. Whole wheat flour, whole rye flour, whole yellow cornmeal and all-purpose flour help to create structure in this recipe for Multi-Seed Crackerbread. Infused into the dough are a multitude of seeds and herbs that bring a brilliant flavor and texture. I used sesame, poppy, flax and caraway for the seed combination and mixed in rosemary, tarragon, thyme, pepper and coarse salt for the herbs. 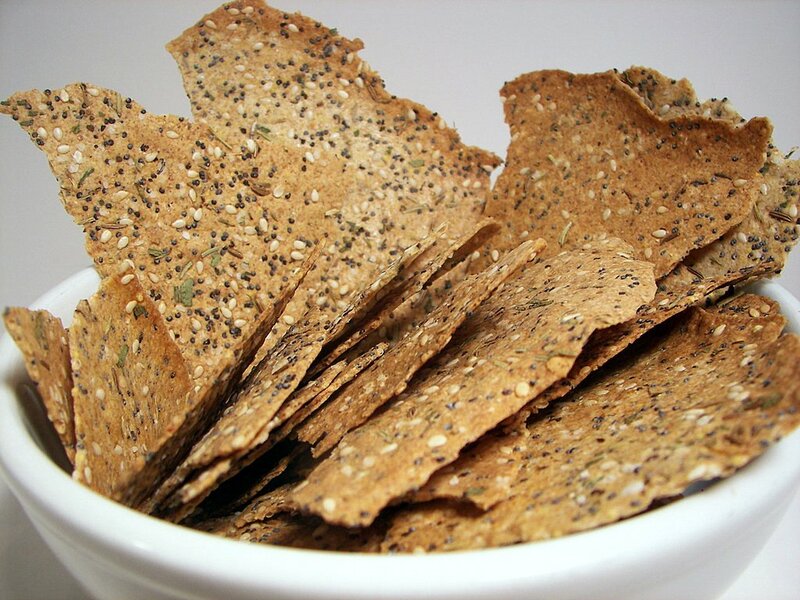 Rather than mixing these flavorful bits into the dry ingredients, the dough is instead rolled into the seed mixture which prevents the dough from sticking and disperses the seeds all throughout the paper thin dough. If it is more comfortable for you, you can finish rolling the dough on a baking sheet lined with parchment so it does not break or tear when you move it over to bake. Baked until golden, this very crisp and crunchy cracker packs a punch in the flavor department - enjoy on its own or use it as a vessel for your favorite dip. They will come out in a big sheet and will be a little flimsy right out of the oven - but once cooled you can easily break them into rustic irregular shapes. We thought that the mild anise and hint of mint given from the caraway and tarragon brought a unique and exquisite taste experience. Well... we were all set to start taking pictures of tonight's dinner, Warm Chicken Sausage and Potato Salad, when we got a call from a friend who needed to be picked up after some car troubles. By the time we got back, we were so hungry we just forgot about the pictures - oops! The potatoes for this salad are cooked in an interesting way - instead of boiling them, they are lightly steamed just until tender. I liked this method as they kept their shape well and were not overly soft or waterlogged. The warm potatoes are then tossed in with baby spinach and covered to keep warm. Tomato, basil and mozzarella stuffed chicken sausages are cut into fun coin shapes and then cooked in a skillet until heated through and they begin to brown. The chunky sausage is added into the spinach mixture while you make the tangy sweet dressing. Cider vinegar, pure maple syrup and grainy mustard are added to the hot skillet the sausages cooked in to scrape up the enticing brown bits that stuck to the bottom - olive oil is then drizzled in and the warm dressing is poured over the salad. While allowing the the spinach to slightly wilt, it also helps to warm back up the potatoes and sausages as long as you eat it right away! This ended up being so quick to make and delectable (even cold...) that it may just hit the table again very soon and we will then have another chance at pictures! Jeff has made a couple mentions that it is feeling like he is eating around the world from some of the flavors in the recipes we've been making this week! Tonight's recipe, North African Vegetable Stew with Poached Eggs, had an interesting combination of flavors and textures for us. The original recipe called for a frozen pepper stir-fry mixture - we somehow ended up grabbing the wrong bag this weekend and instead came with one filled with peppers, onions, broccoli, carrots, mushrooms and water chestnuts. I really didn't feel like going out when I noticed the error, so we just went with it. After the veggie mixture is cooked, the original recipe calls for leaving them in while you finish the rest of the recipe - however, with the mixture of veggies we had, I took them out and added them back in at the end so they didn't loose their integrity and get all mushy. A crushed spice mixture of coriander seeds, caraway and salt with some fresh garlic is then added to the pan and cooked just until a fragrant aroma starts to escape. Chickpeas and fire-roasted chunky tomatoes are added and allowed to simmer until the mixture begins to thicken. 4 eggs are then broken into the simmering juices and they gently poach until set. This had very good flavor - the egg on top was a fun finishing touch, but I think the amount of different vegetables in the mix was just a bit too distracting. I highly suggest using only a mix of peppers and onions instead. Tonight's dinner, Oven-Crisp Black Bean and Corn Flautas, is a lighter twist on a dish that is commonly fried. 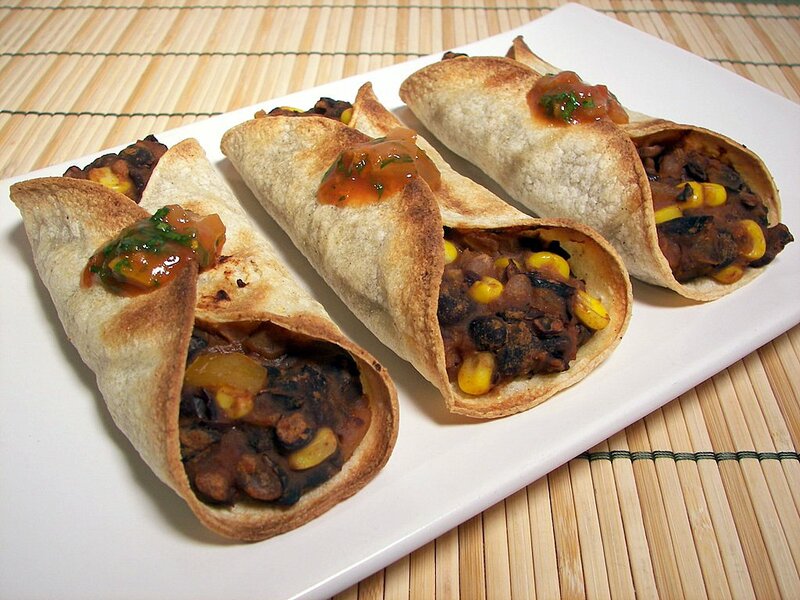 Usually when they are cooked that way, flour tortillas are used to encase the filling - however, these use corn tortillas to help give them a crunch as they are only baked in the oven. The filling starts with a sauté of onions and fresh garlic - black beans, vegetable broth and two types of chili powder are then mixed in. While you could use all regular chili powder, I used ancho chili powder for half the amount to bring a smoky deep flavor to the filling. This mixture is now coarsley mashed - this is just to thicken the mixture, but you still want some whole bean pieces for a contrast in texture. Salsa and corn kernels are then added in - I used a habanero and lime salsa to bring a bit of heat to the filling, but feel free to use whatever kind strikes your fancy. The bean mixture has to now have a chance to cool down - this helps to prevent cracking when you go to fill and roll the tortillas. *Extra tip - when you go to roll them, heat the tortilla for just 10 seconds in the microwave and they will be much easier to work with. Baked in the oven, these golden crisp rolls are served with extra salsa on the side that has been rejuvenated with chopped fresh cilantro. While I'm sure the fried version would be fantastic, this lighter option was filling and still had a satisfying crisp texture - just without the guilt. Yes... it is Tuesday again, which means another round of baking so Jeff can bring in goodies for Wednesday Treat Day at his office. I went for a layered bar recipe this time and think I found one that could easily be changed around to use what you may already have on hand. 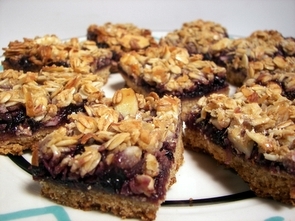 On the bottom of these Blueberry Bonanza Bars is a thick and crisp crust laced with toasted almonds. To ensure the crust stays firm, it is pre-baked from a cold state just until the edges begin to turn golden. While you wait for this to cool, you begin working on an almond-coconut granola that will become the topping. Rolled oats, sliced almonds and coconut are tossed together with a warmed mixture of butter, honey and brown sugar. To assemble, a layer of chunky blueberry preserves is first spread over the cooled crust followed by a final layer of the homemade granola. The bars are then placed back in the oven to set the preserves and to turn the granola into a crunchy golden brown topping. The richness of the nutty shortbread-like crust is cut from the dark sweet preserves with the faint coconut-scented granola adding a crunchy finish. These would be nice to play around with different flavor combinations - maybe apricot and walnuts or orange and pecans? If you found that you enjoyed the clumpy granola topping, you could make that just by itself - bake in a 325 degree oven until golden - about 25 minutes. I got one of those "looks" when Jeff saw I pulled out an avocado that he didn't notice we bought this weekend to use in tonight's dinner of Cumin-Dusted Chicken Breasts with Guacamole Sauce. They happen to be one of those ingredients he is adamant he does not like, but I figured we would give it a go anyways and see what happens. I'm usually pretty good at weeding out things that he for sure would not like and I think he has gotten that hint by now. The sauce is a quick-to-make combination of chunky mashed avocado, sour cream, green onions, parsley, fresh lime juice and a few seasonings. The chicken portion of this dish is coated in a sweet and smoky mixture of brown sugar, cumin, salt and pepper. First seared in a hot skillet, the breasts then go for a trip into the oven to finish cooking. 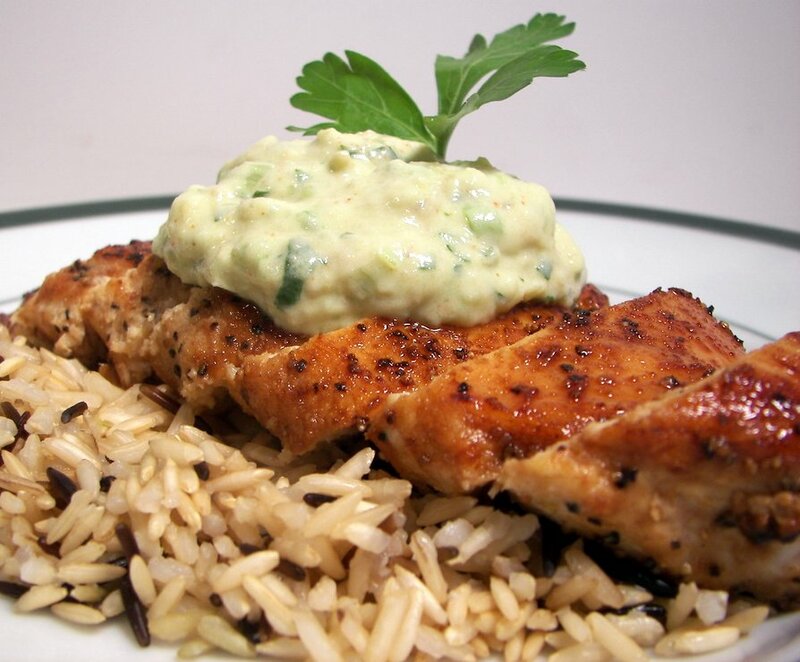 The seasonings on the glistening chicken make for a killer sweet caramelized coating that cuts through the heaviness the avocado brings to the sauce. Cool with a refreshing lime tang, the generous sauce bites back a bit with heat from a little addition of ground red pepper. 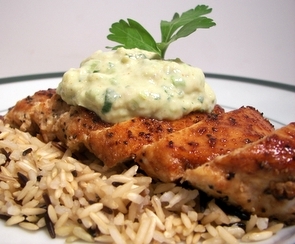 Since the chicken and sauce are so well flavored, we served this over a mild mixture of brown and wild rice. 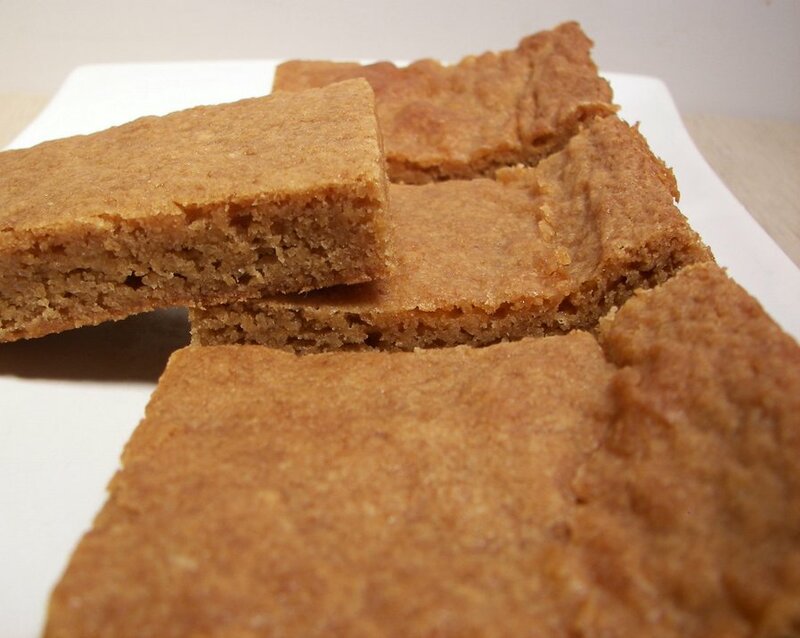 To keep the freezer stocked with a variety of snacks, yesterday we baked a pan of Butterscotch Blondies. This recipe begins with an important step - unsalted butter is melted until it releases a nutty aroma and starts to turn from the clearer melted color to a definite browned appearance. Since you will be adding eggs to browned butter, you need to let it cool for 10-15 minutes so as to not cook the eggs. For the dry ingredients, I thought I would include some whole-wheat pastry flour with the all-purpose to match the nutty flavor the butter adds. I also used a combination of dark and light brown sugars to give a richer depth to the sweetness in these blondies. The texture of these bars is very chewy and while they are exceptionally sweet, we both agreed it was not too sweet to thoroughly enjoy. Let me say that if you are looking for a more true butterscotch flavor as the recipe name leads to, you may be disappointed. However, they are delicious and I would make them again. These are best eaten after they have had a chance to sit around to allow the flavors to deepen - good on day one, but even better today! In tonight's dinner, Curried Couscous, Spinach, and Roasted Tomato Soup, we used a kind of couscous we have not used before - it was not all that easy to find either. Instead of the smaller couscous, this recipe uses Israeli couscous - the pearls are much bigger and have different texture when cooked. 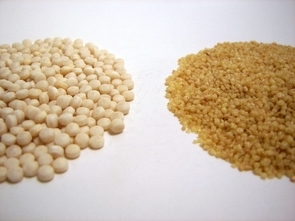 About the size of tapioca pearls, these are more related to pasta as they are extruded... similar to orzo. Wedges of thick plum tomatoes are first roasted in the oven under high heat until very tender and they begin to turn lightly browned. While these roast, the base flavors of the soup begin by sautéing onions until soft, followed by the addition of the toasted couscous, curry powder, hot madras curry powder and garlic. The tender tomato wedges are then added along with some turkey stock. 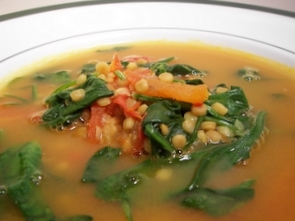 After simmering until the couscous is almost tender, fresh baby spinach is added right before serving and allowed to gently wilt. To deepen the flavor of the soup and add a hint of heat, I used two kinds of curry powder - you can use which ever curry powder you would like. The turkey stock that I used was leftovers from Thanksgiving that I had in the freezer - again, feel free to use chicken stock or broth if that is what you already have on hand. Toasting the couscous before using added another layer of flavor to the soup - we also both liked how this couscous had more bite to it and did not turn mushy. Can you believe this weather? It surpassed the 70 degree mark today... we are in January right? We are warmer today that they will be in Phoenix - that's not right! But... since I'm always cold, I'm not complaining! We have the windows open to let the fresh breeze clean out the stuffy air and the pups are thoroughly enjoying romping around outside in the grass - well... more like just sunning themselves as they are kind of lazy. PS - A note to the grass outside... just because it is warm and the trees are starting to bud does not mean you can start growing - I will not be mowing in January! I have not made anything with yeast lately and I'm getting the bread baking bug again. 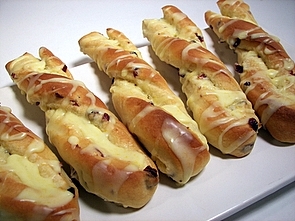 Since we still have some bread in the freezer, I opted to go for a sweet treat and made some Cherry-Orange Twists this morning. To make the kneading process a little easier, we played around with beating the dough while it was still quite loose with a mixer for a few minutes. It only took about 3 minutes worth of kneading by hand for the dough to become smooth and elastic. With the inclusion of butter and milk, the dough is soft and quite easy to work with. 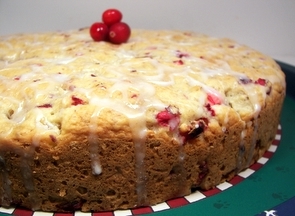 Flavoring the dough is fresh orange juice, zest and dried tart cherries. Once risen, this wonderful dough was easily rolled out - we then slathered half of it with a sweet filling made from softened butter, sugar, flour and a bit more zest. The naked side is then folded over the filling and the dough is cut into long strips. These are then twisted and placed on a baking sheet to rise one more time. The twists turn a light golden and open up just slightly as they bake - when they are done and still warm, a simple orange-y glaze made from confectioners' sugar, orange zest and fresh juice is drizzled on top for a finishing touch. Exploding with layers of orange flavor, Jeff has officially proclaimed these "worthy of a spot in a fancy bakery." While I don't know about that, these twists landed a spot on my short "must make again" list. If you have visited us a few times, you probably know that we love muffins - they freeze well and make for excellent on-the-go snacks. However, this Cran-Apple Ginger Muffincake I baked today brings a new look to the smaller, individual-size goodies. While some muffins could be mistaken for a dessert, this muffincake is less sweet, making it perfect for a mid-morning or afternoon snack. Filling the inside of this tall beauty are chunky granny smith apples and tart fresh cranberries with a toasted nutty flavor coming from finely chopped pecans scattered throughout. I kept the ginger faint so there is just enough to make you wonder what else is in it, but I think it could be increased some - crystallized ginger may be a good option as it could also bring a touch more sweetness if you prefer that. Be sure to keep the apples on the chunky side - this way they don't go too soft and have a more pleasurable bite to them. 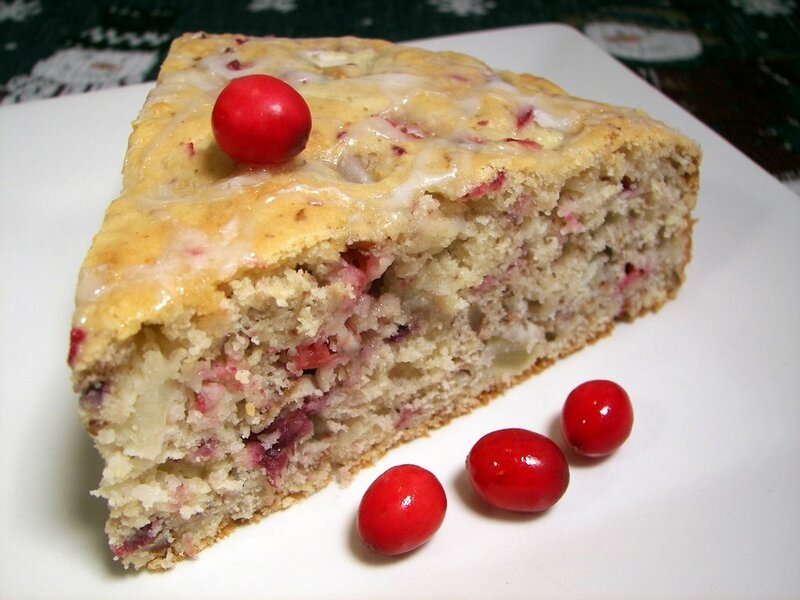 Drizzled with a light glaze, this tender and moist cake spotted with color made for a fine substitute to our regular muffins. Woo... spicy! This is how we decided to describe tonight's dinner of Jamaican Jerk Chicken Hash. I almost didn't get a chance to make this... I forgot that the chicken needed to marinate for 24 hours and at 9pm or so last night, I thought "Oh crap, I need to get the chicken going!" Thankfully, from the use of a food processor, the marinade came together quite quickly and didn't make too much of a mess before we headed to bed. Green onions, fresh ginger root, a habanero (yipes! ), lime juice, dark rum, molasses, allspice, thyme and garlic are pureed until mostly smooth - this is then combined with a mixture of chicken and left to chill in the refrigerator. Feel free to use a seeded jalapeno instead if you want to tame the heat. The original recipe called for 1 1/2 pounds of chicken thighs, but I only had a pound in the freezer - so I added a couple chicken breasts to match the weight called for. Cubed russet potatoes are boiled until just tender and left to cool while you start heating the skillet to cook the chicken. 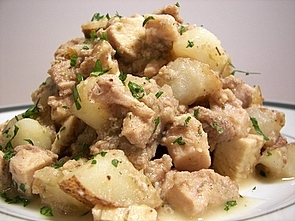 The pungent marinade and chicken are then cooked together - when done, the chicken is chopped and added back into the skillet along with the potatoes and some evaporated milk. It looks a bit wet at first, but as the mixture cooks just until heated through, it begins to thicken up and the potatoes drink in the strong flavored sauce. I would suggest using all thighs, but this mixture did work good - the chicken was extremely juicy and the darker meat brought a rich depth of flavor. 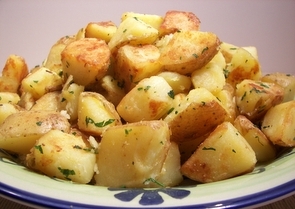 This was absolutely delicious and filling - however, I kept thinking how much better this could be if the potatoes had a different texture - usually when I think of a hash, the potatoes end up being well browned and have a more crisp texture. It may not get an A+ for visuals, but that didn't stop us one bit from devouring this. Looking for lighter dinner fare?